Brett Moist/ for the Northwest Herald Mchenry's Evan Hying runs past Larkin's Chris Villalobos during the first half of the Sectional Final game at Huntley High School on Saturday. 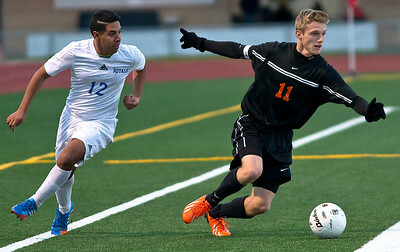 Larkin defeated Mchenry 1-0. 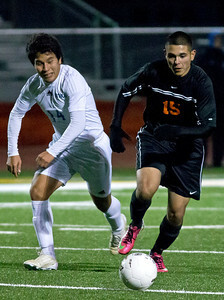 Brett Moist/ for the Northwest Herald Larkin's Freddy Alvarez chases down the ball with Mchenry's Ovidio Jasso during the second half of the Sectional Final Game at Huntley High School on Saturday. 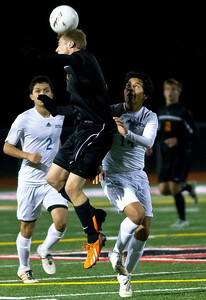 Larkin defeated Mchenry 1-0. 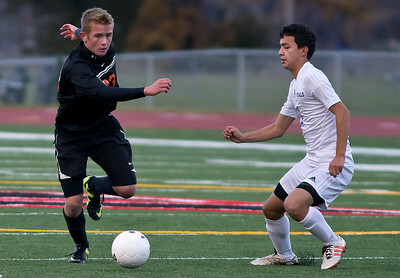 Brett Moist/ for the Northwest Herald Mchenry James Mulhall kicks the ball past Larkin's Moises Raya during the first half of the Sectional Final game at Huntley High School on Saturday. Larkin defeated Mchenry 1-0. 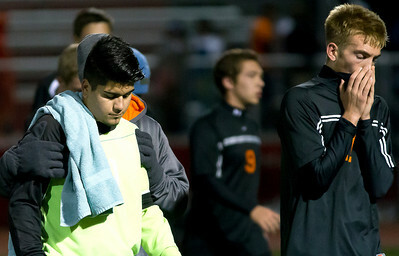 Brett Moist/ for the Northwest Herald Mchenry Goal Keeper Frankie Valle (left) and Phil Shelton walk off the field emotional after their loss to Larkin 1-0 in the Sectional Final at Huntley High School on Saturday.